A calibrated phylogeny of the family indicated that the major lineages within the family evolved during the fragmentation of the Gondwanan supercontinent. The split between the Pergidae and its sister group Argidae was estimated at about 153 Myr ago. No central dichotomous division between Australian and South American pergid sawflies was observed, showing that the major lineages within this group had already evolved by the time Australia had become completely isolated from Antarctica. The molecular dating analysis strongly indicated a co-radiation of Australian pergid sawflies with their Myrtaceae hosts and suggest that the two eucalypt-feeding clades, pergines and pterygophorines, colonised their eucalypt host plants independently during the Palaeocene, at the time when their hosts appear to have started radiating. Simplified phylogeny of Pergidae with host plant information in relation to major geological events. The molecular dating analysis strongly indicates a co-radiation of Australian pergid sawflies with their Myrtaceae hosts and suggest that the two eucalypt-feeding clades, pergines and pterygophorines, colonised their eucalypt host plants independently during the Palaeocene, at the time when their hosts appear to have started radiating. The break-up of Gondwana and the timing of the subsequent climatic change in Australia, leading from vegetation adapted to a seasonal-wet conditions to the arid-adapted sclerophyll vegetation typical of Australia, suggest that the species-poor subfamilies occurring in rainforests represent remnants of more diverse groups that were decimated through loss of habitat or host species. 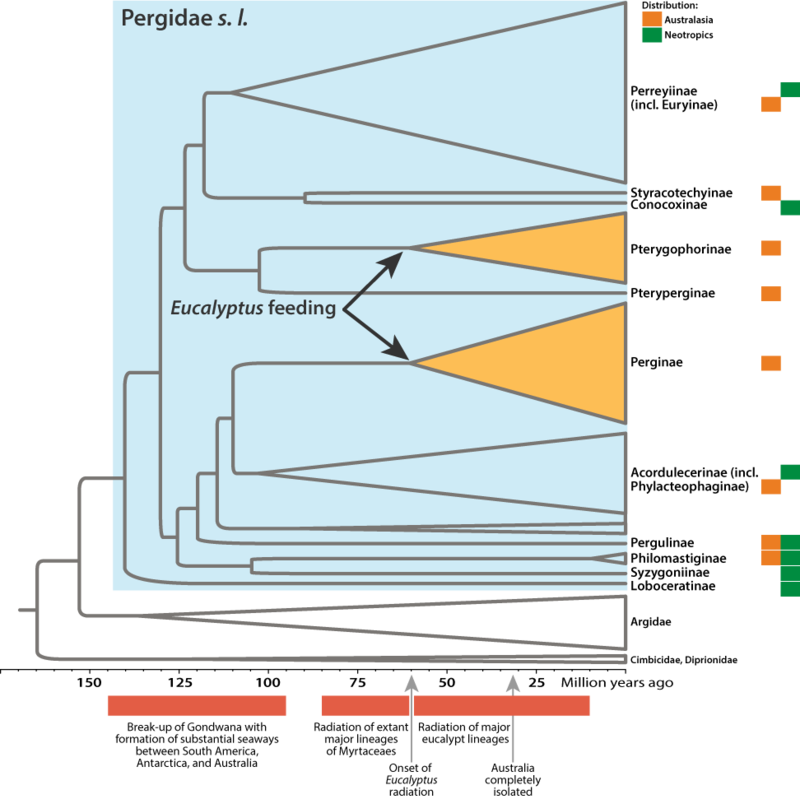 The analysis included representatives of 13 of the 14 previously recognised subfamilies of Pergidae, almost all of which were supported by the molecular data. Exceptions include the Euryinae (paraphyletic in respect to Perreyiinae), the Acordulecerinae (paraphyletic to the Perginae), and the Australian Phylacteophaginae (placed within the Acordulecerinae).